Monitoring & Forecasting the Fastest Receding Arctic Ice in History Nano Satellite Launch Set for Next Fall – Weathernews Inc.
Weathernews Inc. (Tokyo, Japan – Chihito Kusabiraki, CEO) has fixed a date for the launch of their WNISAT-1 satellite from the Yasny Cosmodrome in Russia next September. WNISAT-1 has been specially designed for monitoring and forecasting polar ice conditions in the Arctic Sea. A continuation of the effort to exploit the seasonal melting in the Arctic Sea, the innovative satellite will provide observation data necessary to fully realize a Polar Routeing service for the shipping industry. Rather than outsourcing the project to the government or large manufacturer, the satellite has been developed independently by Weathernews in partnership with start-up AXELSPACE (Tokyo, Japan – Yuya Nakamura, CEO) to be an ultra-compact solution to help ensure safe voyages through the Arctic Sea ice. Ice in the Arctic Sea has been receding progressively every summer for the past few years as a result of global climate changes. These changes have conveniently allowed commercial vessels to transit this area, which is normally blocked by pack ice. This summer saw ice receding at a record pace, opening a route (northeastern passage) from the Siberian Coast almost a month earlier than usual. The route allows a vessel sailing from Europe to Asia to complete the voyage in 2/3 the distance of a typical route via the Suez Canal, and half the time of a route via the Cape of Good Hope. It is said that widespread adoption of this alternate trade route by the logistics industry will dramatically reduce the time, fuel and environmental impact of global shipping traffic in the future. At Weathernews, monitoring and forecasting conditions in this region has been a major goal since putting together a project team in 2006. WNISAT-1 is an example of Weathernews' continuing efforts toward the realization of this dream. This summer, Weathernews has been providing information on ice and weather conditions in the Arctic to help ensure a safe crossing for the commercial freighter, Sanko Odyssey, while sailing through the opened northeast passage between August and September. Information provided on Arctic Sea ice conditions was based on data from satellites already in operational orbit, along with Weathernews original forecasts for currents, winds and waves. 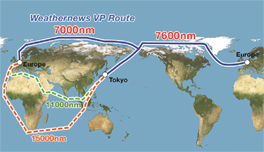 In addition, Weathernews is receiving data from the Sanko Odessey which will be used to improve the quality of the two-way information sharing process as another preparation for launching a fully realized Polar Routeing service. For monitoring of Arctic Sea ice, Weathernews is relying on data from government-operated satellites at this stage. However, keeping in line with the goal of helping to ensure the safety of vessels sailing through the Arctic, a higher volume of data requiring a higher rate of monitoring means that an independent satellite is needed to realize a Polar Routeing service. Weathernews began development of such a satellite in 2008, focusing its design on functionality for monitoring ice, rather than multiple applications common in larger satellites. Ultra-compact (27cm cubed) and highly functional, the comparatively reasonable operating costs of the satellite will allow Weathernews to provide a Polar Routeing service for customers at a reasonable cost as well. Currently, the production model of the satellite is undergoing testing with Axel Space who are using their various expertise to ensure it will function in sun-syncronus orbit. 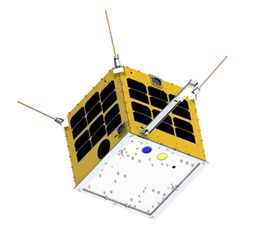 WNISAT-1 will complete 15 full orbits of the planet each day, taking pictures of the Arctic Sea ice with a small camera and sending the pictures back to Earth where they will be analyzed by the Global Ice Center at Weathernews to create content for pioneering shipping companies operating voyages through the polar region. The satellite will be launched into its orbit piggybacked on a Dneper-1 rocket on 28 September, 2012.